You may not notice the chipped paintwork on one of the doors in your home. However, you can bet it will be the first thing to catch the eye of your mother in law when she arrives for one of her visits. Fixing the problem may feel like a major project, but it's really not as difficult as it seems. Once you've finished, you'll enjoy a real sense of achievement. You'll also realize just how much the chipped door detracted from the overall look of your home's interior. Remove chipped paintwork and prepare the door thoroughly before applying primer and paint. Slide the drop cloth under the door until half is on one side and half on the other. This will protect your flooring from paint and debris. Use the doorstop to hold the door in one position. This should allow people to pass through the doorway without touching any newly painted surfaces. Unscrew the door handle, and set it on a shelf until you have finished repainting the door. Put on a pair of rubber gloves. Decant some liquid paint remover into a polyethylene container. 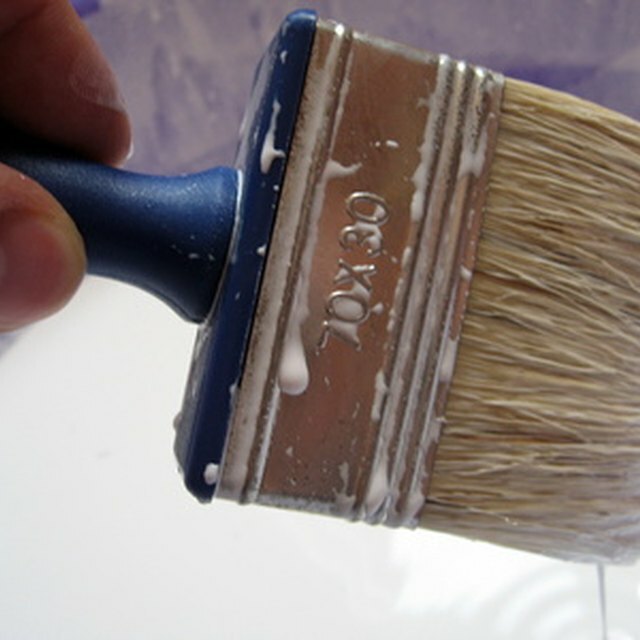 Brush it on to the door's painted surfaces, and leave it until the paint begins to bubble up. Scrape the softened paint off the door with a scraper, and place the scrapings in an old container you are happy to throw in the trashcan. Once all the paint is removed, wash the surface down with turpentine substitute. The turpentine substitute will neutralize the paint stripper. Check the door's surfaces for holes or indents. If you find any, apply filler with a putty knife, and remove the excess with the putty knife. Once the filler is dry sand it level with the rest of the door surface, and lightly sand the entire door surface to provide a grip for the primer. Vacuum the door thoroughly with a brush attachment to remove all traces of sanding dust. Divide the door surface mentally into eight imaginary squares. Apply primer to each square, starting at the top and working down. Apply the primer towards the edges to avoid any build up on them. Repeat the process on the other side of the door. Allow the primer to dry thoroughly. Lightly sand it, vacuum away the dust, and apply a second coat. This must also be allowed to completely dry. Sand the dry primer lightly, vacuum away the dust, and apply the first coat of paint. Use the same method of dividing the door up into imaginary squares. Once again, paint towards the edges to avoid any build up on them. Check carefully for runs, and brush them out before the paint dries. Repeat the process on the other side of the door. Allow the painted surfaces to dry thoroughly. Lightly sand them, vacuum away the dust, and apply a second coat of paint using the same process. The paint must be completely dry before you re-attach the door handles. Keep children and pets away from the area in which you are working, and make sure everyone in the house knows the paint on the door is wet. Never work with liquid paint remover unless your hands are protected by rubber gloves. Keep the area in which you are working well ventilated.